What are the KLEWS to real learning in the classroom? 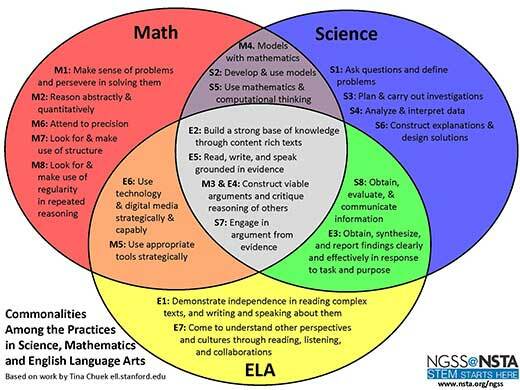 In order for the vision of the Framework and the Next Generation Science Standards (NGSS) to be successful, science education cannot be something we only tackle in secondary school. In some ways, it’s easier for us to get buy-in from middle school and high school science teachers, who often have a background in science content. The challenge of supporting elementary classroom teachers, who sometimes lack the same confidence when it comes to science, is critical when it comes to NGSS implementation. In order to meet this challenge, Urban Advantage (UA) has been working on a pilot program with about 40 New York City classroom teachers, from third through fifth grades. 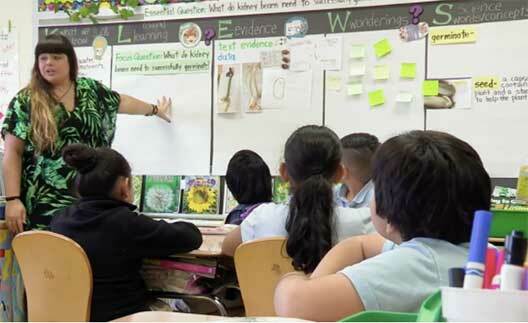 This program, a collaboration between education staff from the American Museum of Natural History, New York Botanical Garden, Brooklyn Botanic Garden, and Queens Botanical Garden, aims to support these teachers by engaging students in authentic science investigations. The KLEWS strategy has been a key feature of this work. A few years ago, I was sharing with Mary Starr, executive director of the Michigan Mathematics and Science Centers Network, the work I'd been doing around scientific explanations for middle school teachers, referring to the book, Supporting Grade 5-8 Students in Constructing Explanations in Science, by Kate McNeill and Joe Krajcik. Mary then asked if I was familiar with the book, What’s Your Evidence?, also by Kate McNeill, along with Carla Zembal-Saul and Kimber Hershberger. That was how I discovered the KLEWS strategy, a powerful tool to support the Claims-Evidence-Reasoning (C-E-R) work we were already doing in our program. So how can teachers begin to use the KLEWS chart right now in their science instruction? Tch Next Gen Squadster Kathy Renfrew puts a practical spin on the theory to highlight a few possibilities. Know: What Do You Think You Know? The Standard: Electric and magnetic forces between a pair of objects do not require that the objects be in contact. The Phenomenon: Students use wands to give "Fuzzy Face" some hair or a beard. How is this possible? 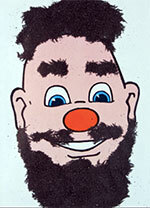 Students will share what they think they know about giving Fuzzy Face some hair. This will give you an idea of what knowledge students will bring to the table, whether it's correct or not. In this video, Kimber explains the KLEWS strategy and Maria discusses what her students thought they knew about how seeds germinate. Using this strategy, Maria gained a lens into her students' thinking early in the lessons. Teachers can use this strategy for their professional learning as well! 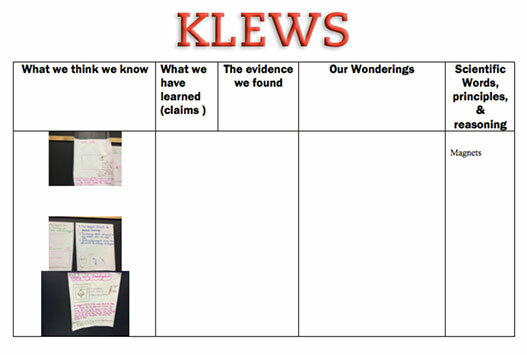 In the following image, some teachers began using a KLEWS chart to document their own learning. Learn: What Is Your Objective? For every lesson we teach, we want our students to be able to tell us what it is that they're expected to learn and, following the lesson, what they've learned from the evidence observed. Students will use the data they collect through investigation, discussion, and research, and summarize their learning by making a claim. In fact, you might choose to guide your students with questions, who will then answer each question with an individual claim. In this lesson video, Kimber asks her students questions to help them clarify their thinking. 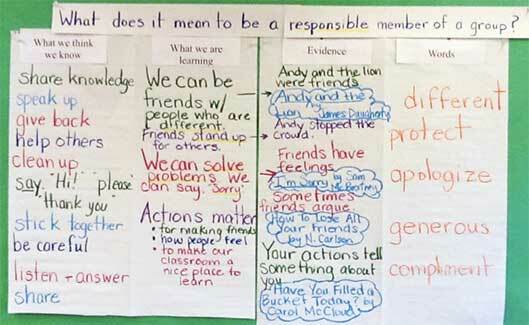 This way they can summarize their learning by making a claim and connecting it to the evidence. Evidence: What Do You Observe? 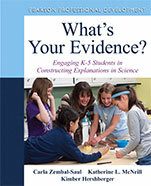 Our students are asked for evidence now in all they do, whether it’s math, reading, social studies, or science. Maria and Kimber asked students many times what was the evidence that substantiated the claim that seeds do not need sunlight for germination and their students were able to meet the challenge. As students collect data in your classroom, they’ll be able to answer your questions by substantiating their claims with evidence as well. Returning to our Fuzzy Face example, What evidence do we have that magnets do not have to be in contact with a material to move it? We know that magnets don’t have to touch the materials to move them because we were able to move the iron filings by dragging the wand over the plastic. 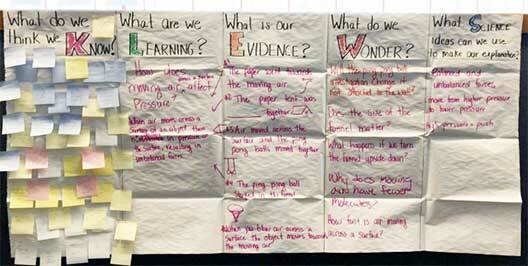 — How might students document their evidence? — What about a photograph of Fuzzy Face? — What are some other ways students might document this evidence? Wonder: What Are Your Questions? Regardless of the disciplinary core idea you’re teaching, you can implement the science and engineering practice of asking questions. Wondering provides your students with the chance to ask scientific questions. And it doesn’t matter where students are in their learning — questions have value at every stage of a unit. A follow-up activity to simply asking questions might be sorting and classifying those questions into lists of the scientific (investigable) and non-scientific (non-investigable). Science: What Terms, Principles, or Research Help You To Explain? I really loved the way the word germination was defined in this video series. Gone is the time when students are handed a vocabulary list and asked to find and write down their definitions. Students need “just in time” words to use after they’ve had multiple experiences with the concept, so the word now makes sense to students and they can use it as part of their scientific explanations. Have your students come up with their own definition based on the evidence from their investigation and then give them time to talk with one another, argue with evidence, and eventually come to a consensus as a group. Finally, have one of your students add their class definition to the master KLEWS chart. How Might Teachers In Other Disciplines Use the KLEWS to Learning in Their Classrooms? Similar connections can be made across all the domains of social studies. And I’ve even witnessed a kindergarten teacher using the KLEWS strategy as a tool for community building. No matter the discipline — since the KLEWS chart is a tool for sensemaking — it makes the thinking of children visible. Students must feel so valued when they see their words on the wall as part of their instruction. As I’ve been working with Teaching Channel on NGSS videos, I felt it was important to capture the process of what it’s been like for one teacher in our UA elementary program learning about KLEWS for the first time. My colleague at AMNH, Tina Glover, who you see in the videos, immediately identified Maria as a teacher who has been open, brave, and willing to take risks while trying to engage her students in using the strategy. Thankfully, Kimber came and worked with Maria a bit on her lessons as well, and we felt it was important to capture both the planning and the reflection of the lesson, in addition to filming the lesson itself. Are you using the KLEWS strategy as you engage students in authentic science investigations? Share your ideas in the comments below. Dora Kastel is a leader of professional development programs at the American Museum of Natural History, primarily focusing on supporting science teachers with the Next Generation Science Standards and Common Core literacy strategies. She is currently co‐project director of an NSF-funded curriculum and research study titled “Moving Next Generation Science Standards into Practice: A Middle School Ecology Unit and Professional Development Model”, in collaboration with SEPUP and the University of Connecticut. She is also a 2016-2017 CADRE fellow. Prior to her work at AMNH, she was a middle school science and math teacher for six years in East Harlem. She earned her B.A. in Geology from the University of Pennsylvania, along with her M.A. in Science Education and Ed.M. in Mathematics Education from Teachers College at Columbia University. She recently returned to Teachers College, and is a first-year Ph.D. student in Science Education. Connect with Dora on Twitter: @Dora_Kastel. Kathy Renfrew is the K-5 science coordinator for the Vermont AOE. She has been deeply involved with the development and implementation of the NGSS and is co-developer/presenter of NSTA: Teaching NGSS in K-5 webinars. Kathy earned National Board Certification in 1998 and won the prestigious Presidential Award for Excellence in Mathematics and Science Teaching in 2000. She taught science for over 30 years. While in the classroom, Kathy won a Toyota Tapestry grant and built a 16×20 foot log cabin with her students outside her classroom window. Kathy’s passion is improving science opportunities and education for all K-5 Students. I loved how the vocabulary was embedded into the lesson and not the lists I've seen some teachers do. While it seems like it should be common practice, taking the time to teach students to be a productive team member is extremely important. Working with 6th grade, I've seen that they come in often not knowing how to be constructive with their comments so showing them how to comment and what to do when they need to comment is wonderful. In addition to asking questions, I think it's important to have students learn what it takes to generate testable questions and questions that are going to lead to discussions and not simple "yes/no" answers that often are the ones they ask. It's an investment in time but worth the payout.